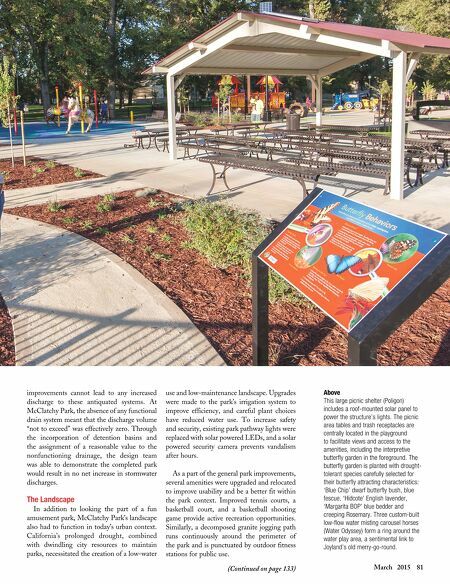 80 Landscape Architect and Specifier News their own set of wheels, a custom skate park sits just beyond the butterfly garden. 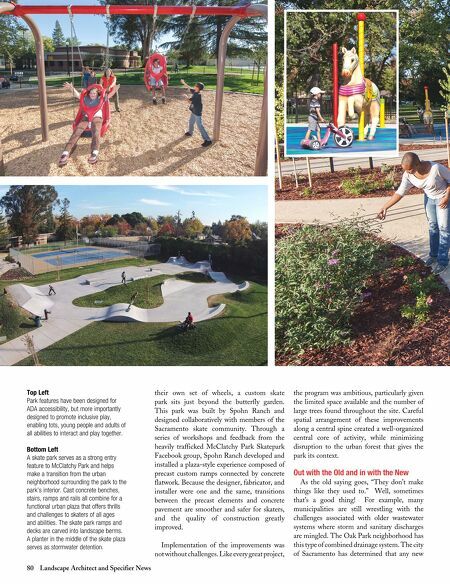 This park was built by Spohn Ranch and designed collaboratively with members of the Sacramento skate community. Through a series of workshops and feedback from the heavily trafficked McClatchy Park Skatepark Facebook group, Spohn Ranch developed and installed a plaza-style experience composed of precast custom ramps connected by concrete flatwork. Because the designer, fabricator, and installer were one and the same, transitions between the precast elements and concrete pavement are smoother and safer for skaters, and the quality of construction greatly improved. Implementation of the improvements was not without challenges. Like every great project, the program was ambitious, particularly given the limited space available and the number of large trees found throughout the site. Careful spatial arrangement of these improvements along a central spine created a well-organized central core of activity, while minimizing disruption to the urban forest that gives the park its context. Out with the Old and in with the New As the old saying goes, "They don't make things like they used to." Well, sometimes that's a good thing! For example, many municipalities are still wrestling with the challenges associated with older wastewater systems where storm and sanitary discharges are mingled. The Oak Park neighborhood has this type of combined drainage system. The city of Sacramento has determined that any new Top Left Park features have been designed for AdA accessibility, but more importantly designed to promote inclusive play, enabling tots, young people and adults of all abilities to interact and play together. Bottom Left A skate park serves as a strong entry feature to McClatchy Park and helps make a transition from the urban neighborhood surrounding the park to the park's interior. Cast concrete benches, stairs, ramps and rails all combine for a functional urban plaza that offers thrills and challenges to skaters of all ages and abilities. The skate park ramps and decks are carved into landscape berms. A planter in the middle of the skate plaza serves as stormwater detention.